Your parents have probably been telling you to stop slouching and sit up straight since as far back as you can remember. If you’re a parent, you probably tell this to your kids now. Unfortunately, with the increase in sedentary jobs (particularly those that spend a majority of the day at a computer) and general fatigue, keeping good posture is getting more difficult. And bad posture can have many negative effects on your health and wellness. Tension Headaches – Sitting hunched over causes your back and neck muscles to tense up! Diminished Breathing – In a slouched position, the motions your body needs to go through in order to breath properly are inhibited. 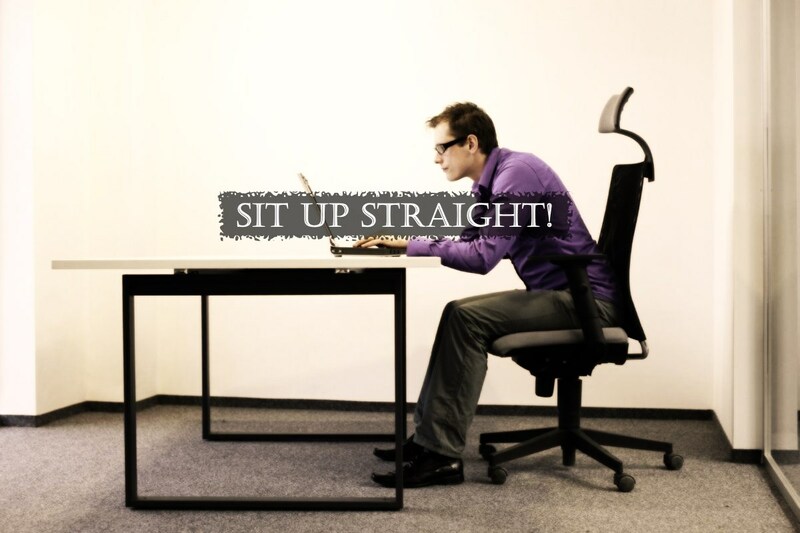 Fatigue – Yes, it’s a cause and a result of bad posture! When your body is out of alignment, your muscles have to work harder to hold themselves in place. Apparent Aging – Slouching can be the first step towards a swayed back, protruding belly, or a dowager hump. Back Pain – Because your back muscles are having to work so much harder to hold your body up in a slouched position, the result is muscle tension and the tendency of the spine to extend beyond its normal range of motion. Work on your core muscles – By strengthening the muscles around your abdomen and back, you can increase their ability to hold your spine straight without becoming fatigued. Schedule regular massage therapy sessions – if you are already at a point of having bad posture, your back muscles are already tense. Loosening these muscles can help you achieve pain relief and begin building good posture. Massage therapy can also give your joints greater freedom to move and relieve pressure points. Practice makes perfect – Sit with intention! With both feet on the ground (legs uncrossed), engage your core muscles and role your shoulders back to be even with your hips. If you are frequently sitting during the day, be mindful of these practices and you will soon find that good posture will come more naturally.